Mr. Mike Lockett, who came to Asahikawa as a member of Asahikawa-Bloomington/Normal Sister City Relationship 55th Aniversary Delegation has donated 9 picture books. Mr. Lockett is a professional story teller and every book has a CD that you can listen to his sotry telling. All books are written in English and Chinese. Starting from one side, you'll read in English, and other side, Chinese. 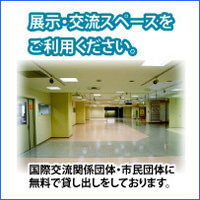 You can rent all books for free at the Asahikawa International Center. All you need to do is to register for the user card. Come and visit us at the center! !